These would benefit from a heated staking tool that slides them into the hole parallel to the axis and flush with the surface. Such things are commercially available, of course, but for my simple needs something involving a cartridge heater, a wall wart, and a drill press may suffice. It would be better if the inserts had actual knurls, rather than splines. So it goes. The actual measurements seem to vary within ±0.02 of nominal and I doubt the manufacturing consistency justifies any assumption tighter than ±0.1 mm. The M3 inserts really do have two different ODs. The M5 insert was listed as “7 mm OD” and measures 7.5 mm, which suggests a typo in the description. So an ordinary cylinder() with the nominal knurl OD or a PolyCyl() with the nominal body OD should suffice. Horizontal holes can probably use a plain old cylinder() with the nominal body OD, because they need reaming anyway. Perhaps a dab of epoxy would bond better with the plastic around a nominal-size hole than forcing the insert into an undersized hole or heat-bonding the insert. Some experimentation is in order. 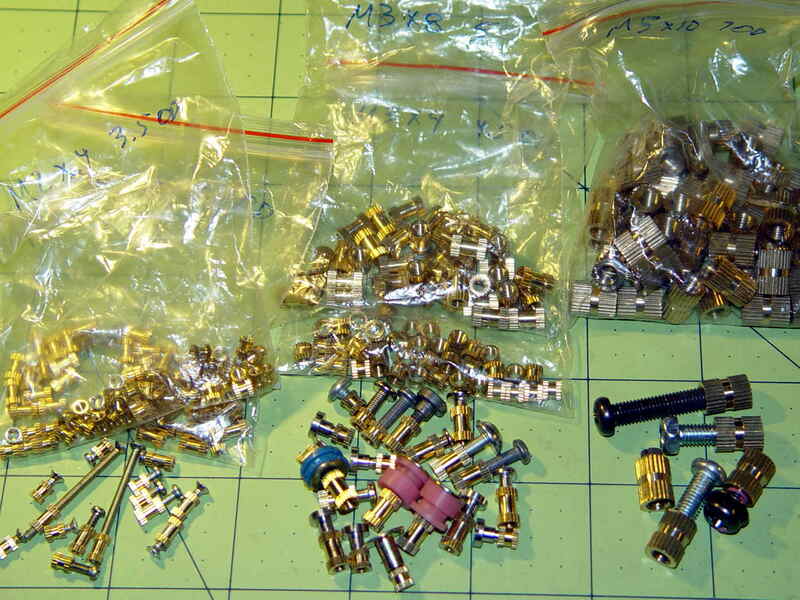 Ten bucks for the entire collection (five bags of 50 inserts each = 250 little brass doodads = 4¢ each), shipped free halfway around the planet, seemed reasonable, given that inch size knurled brass inserts run anywhere from 50¢ to upwards of $2 a pop and a Genuine Helicoil 4-40 insert sets you back just shy of a buck. Inch-size inserts with knurled rings intended for ultrasonic bonding seem to be 5¢ to 15¢ on eBay. I think the straight-side versions will work better than the tapered ones for heat or epoxy bonding. It knurls my knuckles that we here in the US haven’t gone solidly metric. 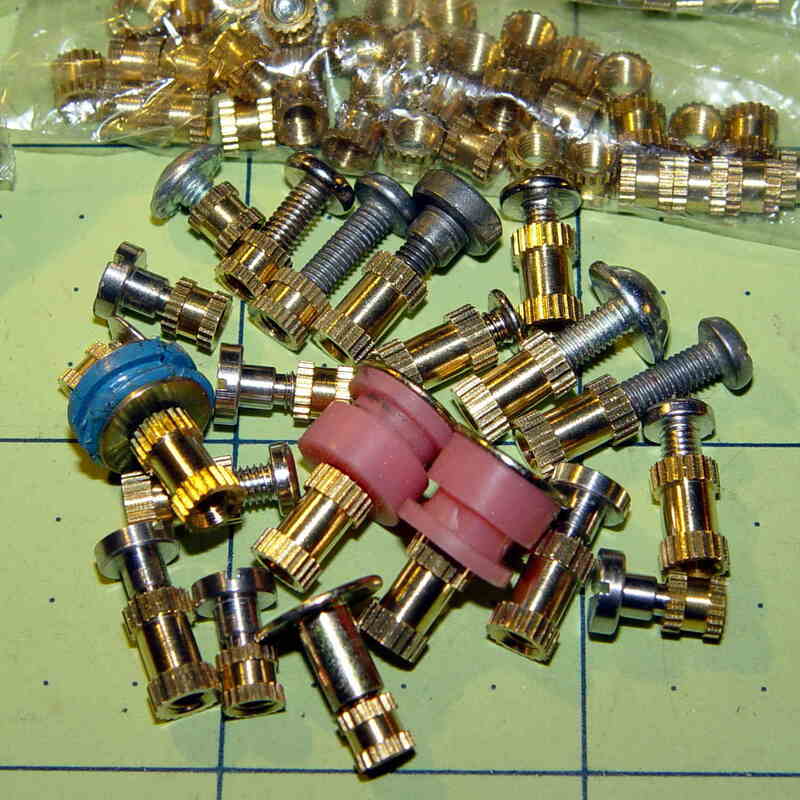 Yes, I have a goodly assortment of metric hardware in addition to the harvested fasteners shown above, but it definitely wasn’t cheap & readily available. This entry was posted on 2016-02-03, 07:32 and is filed under Machine Shop. You can follow any responses to this entry through RSS 2.0. Both comments and pings are currently closed. Can’t wait to see what contraption you’ll conjure up for installing them. That happens, too, but from what little I know, most of the inserts get rammed into their sockets. After a bit more playing around, I definitely favor epoxy. The tolerances aren’t in my favor for holes with those dimensions, so a dollop of gap-filling adhesive solves many problems at once. On the Heath H8 CPU and the H19 terminal, they used these inserts for the plastic case bits. It was a reinforced (not glass, IIRC) thermoplastic, so a fine tip on a Weller soldering-station iron let me get the inserts in properly. Heath probably used these on the dot matrix printer, but I don’t recall any more. The splines are better for resisting rotation, knurls are better for resisting pull-out. Threads are best for resisting pull-out and worst for resisting rotation. Which is “better” depends largely on what problem you’re trying to solve. That said, I’m fond of knurls too for general purpose embedded fasteners. A hole tapped directly in the plastic works fine for the trivial loads applied to most of my projects and an ordinary nut trapped on the far side suffices for “high load” and “frequent use” parts. The inserts will be fine for covers, bottom plates, and suchlike, where the screws get more than one-time use and don’t have a convenient “other side” for the nut, but don’t have much of an applied load. I had some success pressing knurled pemnuts into 3d printed plastic after I’d dipped the part I was about to hit into boiling water for a minute. I used a drillpress with a reversed drill on which the pemnut in question fit snuggly enough it would be retained through the press cycle. That was sometimes helped by sticky residue from duct tape on the drillbit. Worked well with the cheap horrible freight drillpress with no table adjustment other than up-and-down. Worked less well with the floor drillpress that has a sliding head and a couple of joints in the table support, because the table would flex and the pemnut would end up at an angle. The epoxy keeps looking better & better, even if I must gimmick up a dispenser for dots of resin & hardener; might be a good use for the 1 ml syringes left over from the plotter ink mixing project. It might make more sense to heat the inserts than the plastic. Puts me in mind of ironworkers slinging red-hot rivets from furnace to I-beam. That’s what ultrasonic and heated presses do, with the inserts mounted on a mandrel of some kind. One of the articles I read described the trial-and-error process required to find the proper parameters: temperature, force, speed, dwell. If you get it right, life is good. Get it wrong and the insert doesn’t bond properly. Would you mind sharing the link to purchase those? $10 seems like just the right amount to keep that supply on hand. The metric-sized inserts came from trawling through eBay searches like “knurled brass insert”, sorted cheapest first. The offerings shift daily and your mileage will vary, but they ran $2.00-ish for 50 pieces a few weeks back. Matt brought a set of those to SqWr a while back and they looked somewhat large for the things I build. IMO they also require more mechanical stability than 3D printed plastic can provide, because the screw seems to put expanding pressure on the insert against the tapped hole. Not to mention they’re half a buck each, you need a tap (you can probably print good-enough threads), and there’s that $300 installation tool. Hm, that link didn’t go exactly where I intended. I meant to point at the Heat-Set Inserts for Plastics, two sections down. Not expensive, inserts with a soldering iron. Those look identical to the inch-sized eBay inserts: the slight taper should align them properly with reasonable soldering iron dexterity. About the same price for inch and three time for metric; what you’d expect in a backward place like this. I don’t know how McM-C handles shipping, other than that they can’t possibly compete with the Politburo. Nice try, but try clicking on your links. Also, what do you mean by 3x more for metric? They seem similarly priced to me. What I meant was their metric inserts run thrice the price of cheap inserts on eBay: 15¢ vs. 5¢, more or less, kinda-sorta. Those nearly overlapped “1” digits did me in; the inch inserts run about the same as the metric inserts.